Even as a consultant, it is unusual to come across a situation in which a little bit of vibration interference could have disastrous consequences. However, when the stakes are high, there’s no reason to doubt that it could happen. I was a vibration consultant for a project that would deliver a new government laboratory building. The program included an electron microscopy imaging suite. A site vibration survey revealed that typical levels were low enough that—in the final product—building vibration levels could easily met the most-demanding of the EM tool criteria. During a meeting, someone asked whether a one-day survey was sufficient. I felt confident that the site was quiet enough—and the margin comfortable enough—that there was little chance that the survey had under-estimated risk of interference due to building vibrations. Still, I asked if they had anything specific in mind. It turned out that a heavy cargo plane made regular-but-unscheduled visits to the site. The laboratory would be just close enough to the taxi path that it was conceivable that planes could affect lab vibration levels as they rolled past. We engaged in some thinking-out-loud about the chances of an airplane landing during scanning. It made sense to begin by asking whether they arrive often enough to worry about. We agreed on a few plausible assumptions: how often planes visited; arrival times vs. lab operating hours; the duration of each pass-by; the duration of each scan by the electron microscope; and the EM duty cycle. My quick conclusion was that the chance of a plane arrival during a scan was at most 0.1% and probably on the order of 0.01%. This would appear infrequent enough to be easily ignored: 1% of 1% is a really low probability. Still, your imaging suite might execute hundreds of scans per year. My ballpark guess was that, each year, there might be a 50/50 chance that a plane pass-by might occur during a scan. Surely, on an annual timescale, they could simply re-start the odd scan that occurred during a plane arrival? One of our research programs uses samples that require months of effort and about $1MM to develop … and the sample is consumed during the scan. This generated immediate panic. An annual 50/50 chance of losing a million-dollar sample could be a deal-breaker. In the end, we all decided that the taxi path was far enough away—and the vibration criteria sufficiently conservative—that these rare-but-regular events wouldn’t present undue risk to lab operations. Furthermore, they planned to process those extremely-high-value samples infrequently; most of their electron microscopy truly would be the type of routine work for which re-starting an affected scan wouldn’t be problematic. But the experience was illuminating: this is the project that first alerted me to the potential importance of rare events, and set me on a path to create systems and tools to better-understand the temporal distribution of vibration levels in research environments. Contact us if you need help developing or working with environmental criteria, whether for an off-the-shelf instrument or for a one-of-a-kind installation. We have consulting experience with toolmakers as well as research institutions, and we can help make your vibration-sensitive product or project more successful. 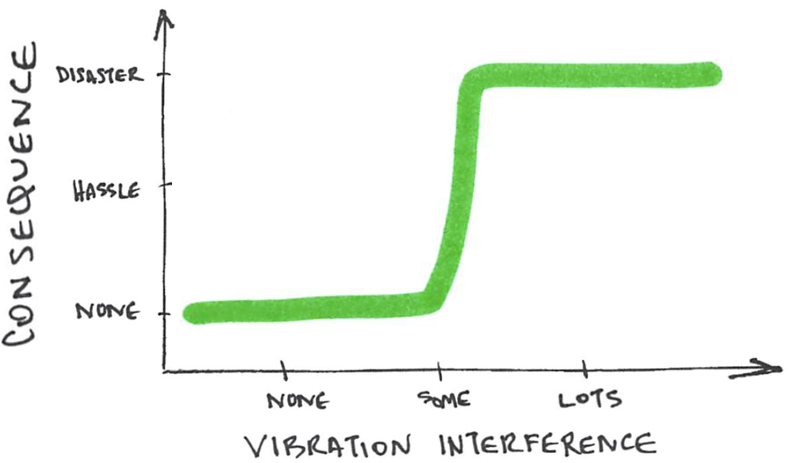 Newer PostWhat kinds of building vibrations are relevant to labs?